This chapter presents a case study in which an online experience for adult learners facilitated improved understanding of blogs and its applications to K-12 classrooms. Data were primarily derived from archived documentation provided by students as components of several completed course assignments. The case study illustrates and examines how the online experience, specifically the creation and maintenance of a blog, supported student learning about use and application of a specific technology. The chapter discusses processes and results given the contexts of adult learning and instructional technology as well as suggests directions for effective practice. Adult learning is a vast frontier for those who want to enhance access and promote success in one’s professional development. The literature identifies that adults are physiologically, psychologically, and sociologically more diverse than children and with varying needs (Lieb, 1991; Long, 1998). They learn best when prior learning is tapped and content learned is meeting their needs. Motivation is high when learning activities are supported by interaction or dialogue and opportunities for self-direction. Also, mistakes are seen as opportunities to further one’s learning. For many adult learners, instruction becomes engaging when critical thinking and problem solving have become part and parcel of the process of gaining practice experience. Given hectic schedules and multiple demands to an adult lifestyle (AASCU, 2006), getting an education online has become an industry within higher education. Course management systems (i.e., Blackboard, WebCT, Angel, etc.) have provided delivery platforms to private entities as competitors of traditional institutions of higher education by offering educational opportunities to those who have difficulty taking on-campus courses in the past. Online learning, in this context, means all or the combination of the following characteristics: “knows no time zones, location and distance”; “access the online materials at anytime”; “real time interaction between students and the instructor”; and “use the Internet to access up-to-date and relevant learning material; and communicate with experts in the field” (Anderson & Elloumi, 2004, p. 5). Stokes (2008) argues that online learning can support working adults in their pursuit for an education by the ability to go to school despite their busy schedule. Online learning has the potential of meeting the educational needs of adult learners. 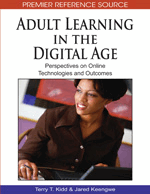 Literature about online learning identifies increased participation by adults on web-based activities like content creation and interactive conversations (Courtney, 2007; Madden & Fox, 2006). Also, emerging technology-based tools (e.g., blogs, wikis, podcasts, etc.) provide new ways to support adult learners in 1) learning content; 2) communicating and collaborating with peers; 3) facilitating critical thinking and problem-solving; and 4) producing creative and appropriate outcomes for target audience (Egbert, 2009). For example, blogs could provide new spaces to learn and share information on variety of content and for different audiences. However, this technological innovation presents enormous challenges for many educators and administrators providing educational experiences for adults due to lack of experience and understanding the potential of this technology-based tool in various contexts.